Want a specific type of garland for your mantel or table setting but can’t find exactly what you’re looking for? 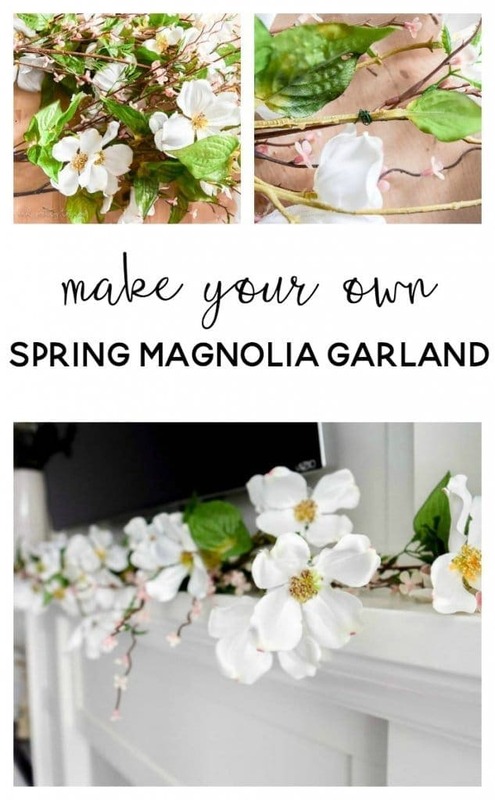 Learn how to make your own garland with this DIY spring magnolia garland. It’s Sarah back from Making Joy and Pretty Things today to share one of my favorite DIYs to make – garland! Now, if you’re like me, I’m constantly looking for something to use to decorate my mantel. And I don’t mean just any mantel. That mantel with the big ugly TV hanging right in the middle. If I decorate only on the side of the TV and leave the center space underneath the TV bare, the mantel doesn’t look cohesive. If I try to find something that looks pretty for under the TV, it either doesn’t fit or it costs a fortune. That’s why I’ve settled on garland to fix the ole’ TV on the mantel problem. 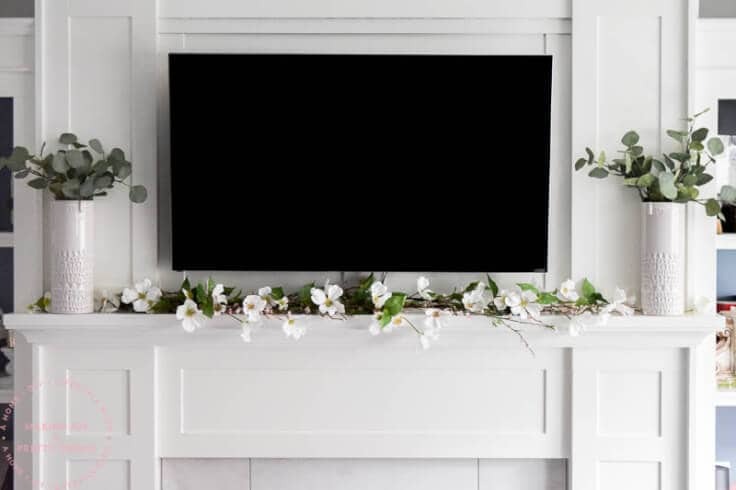 If you don’t have a TV on your mantel you can still use garland across the middle. Use an old window or a few layered frames behind the garland and you’ve got yourself a pretty mantel. The problem with store bought garland is it can get pretty expensive. And, on top of that, you can’t always get exactly what you want. Sure you may like some of the flowers in the garland but is it worth spending the money on something you’re not 100% sold on? 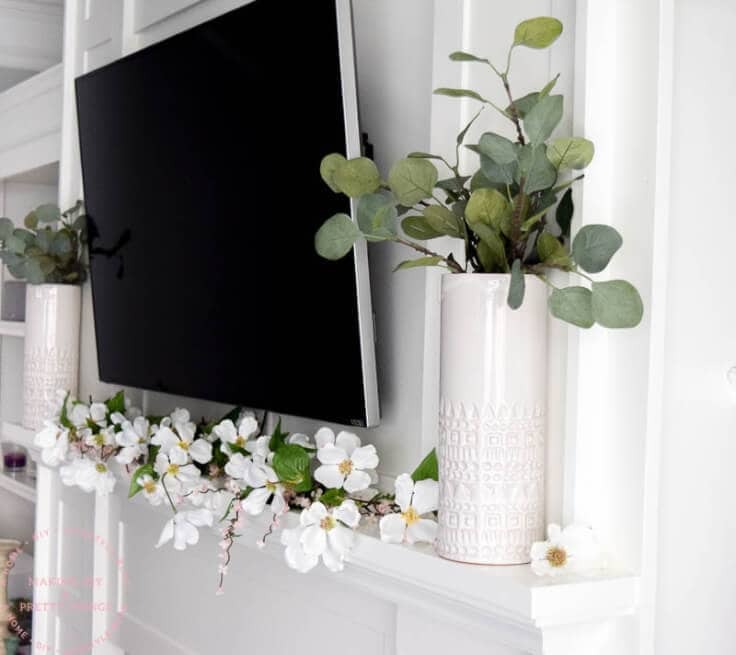 Well, my friends, I recently finished our farmhouse spring mantel and made the most perfect spring garland to fit right under the TV. For my spring mantel, I went with a farmhouse style theme which meant lots of neutrals and greenery. 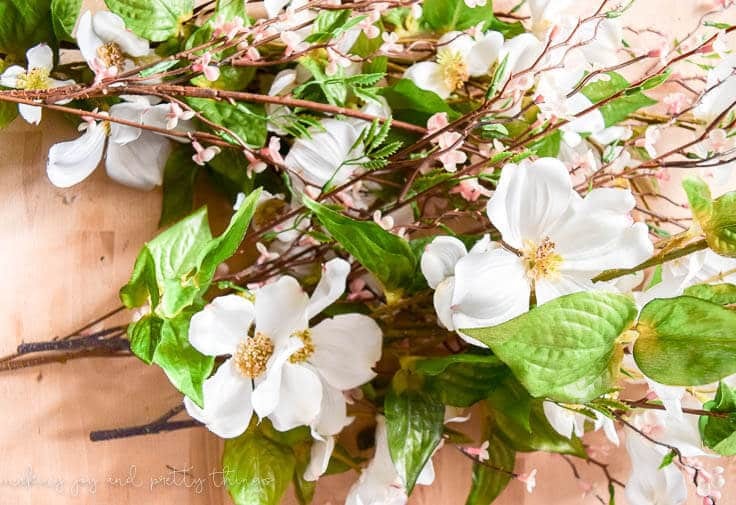 On a trip to Hobby Lobby, I stumbled across exactly what I was looking for – magnolia flowers! I mean, nothing says farmhouse more than magnolia flowers, right?! I started with 3 bunches of magnolia flowers and 3 bunches of peach blossoms. You can get these at Hobby Lobby (or Michaels has great options, too!). 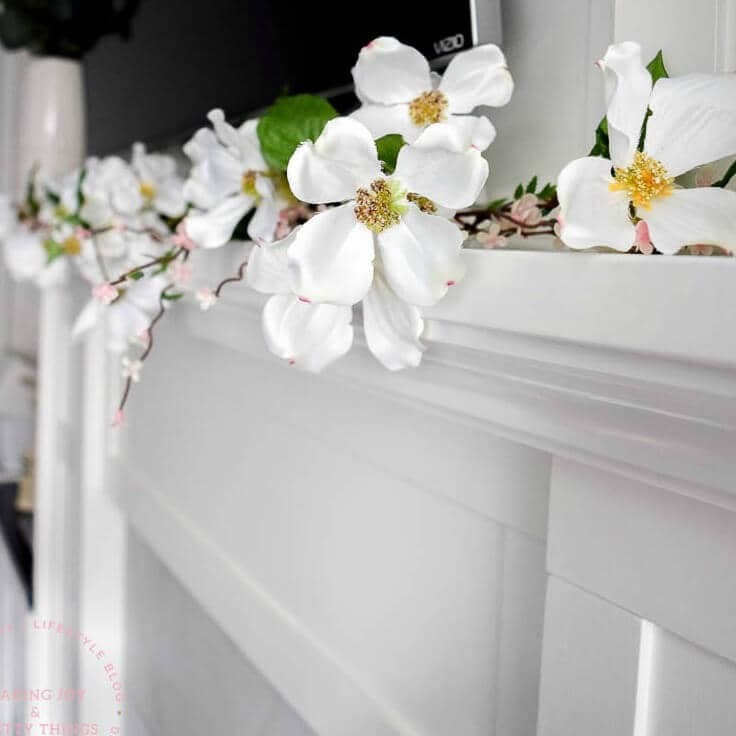 I love the white magnolia flowers for a farmhouse style look. And, the pretty pale pink blossoms add a subtle touch of color. But, you can pick anything you like which is what makes this project so unique and fun. Next, I grabbed my floral wire and got to work! 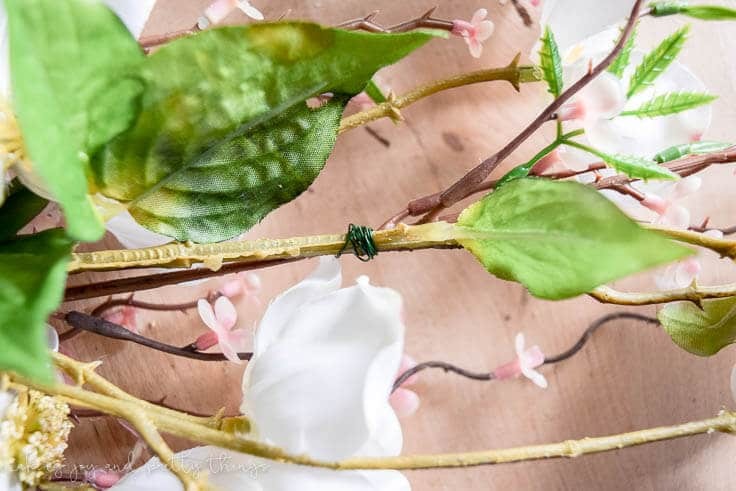 I placed a peach blossom bush flat on the table followed by a magnolia bush overtop. You have to play around with the exact placement of each type of flower you’re using. For my garland, I ended up pushing the magnolia bush a little further down the peach blossom bush. 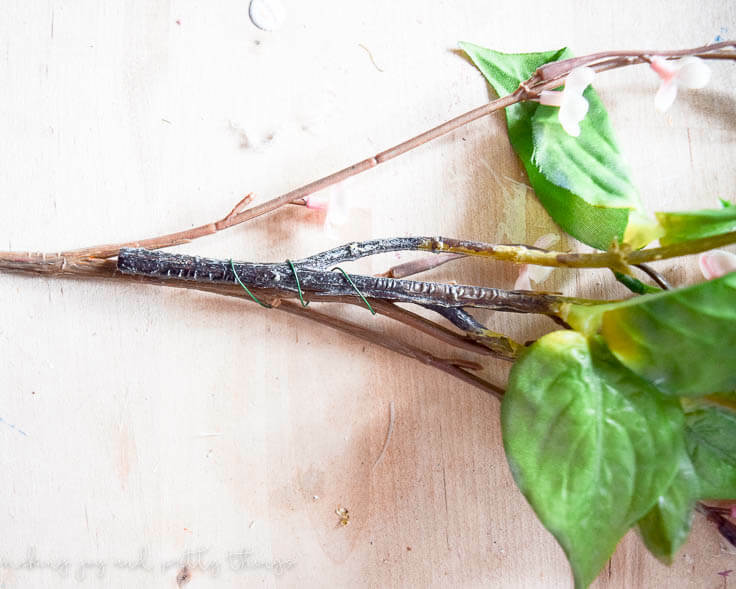 I then wrapped some floral wire around the two stems until it felt secure (about 3-4 times around). I did the same thing at another point along the stems closer to the end. You don’t have to worry about the wire being visible since it blends in with the stems and flowers. I then placed another peach blossom bush at the end of the first peach blossom bush (regardless of where the magnolia bush started/ended). This is so you don’t have any gaps along the garland. The next magnolia bush can be added after the first magnolia bush in the same manner. Once all the bushes were connected, I placed the garland along the mantel. Just to make it look more natural and “real”, I pulled some of the magnolia flower up/out/down so that they pointed in different directions. And, here’s the finished product on my mantel!! Isn’t it so pretty!? You’d never know I didn’t spend a fortune on it in the store. 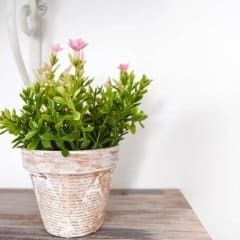 Looking for more DIY spring ideas? Sarah is a wife, boy-mom, and ultimate procrastinator. 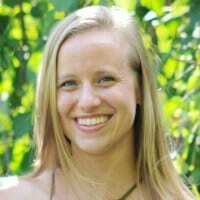 She may be a part-time pharmacist by day, but she’s a full-time crafting and DIY addict and lover of joy-filled days. 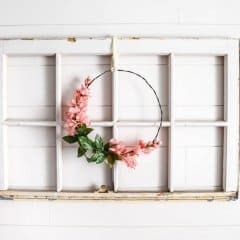 She shares all of her budget-friendly and family-friendly ideas as well as some joyful inspiration over at Making Joy and Pretty Things. When she’s not busy making farmhouse or rustic decor, she enjoys being outdoors with her sweet little boys or sipping coffee with her husband. Follow Sarah on Facebook, Twitter, Pinterest and Instagram.